This season’s designs come in trendy silhouettes, maxi lengths and dungaree styles. Wear her with best / T-shirt / Vest and a sports-cool cap. 3-4 Years(Tag Size 110 cm): Pants Length:27″.—Waist:22″.—Hip:25″. 4-5 Years(Tag Size 120 cm): Pants Length:29″.—Waist:23″.—Hip:27″. 6-7 Years(Tag Size 130 cm): Pants Length:31″.—Waist:25″.—Hip:29″. 8-9 Years(Tag Size 140 cm): Pants Length:33″.—Waist:26″.—Hip:30″. 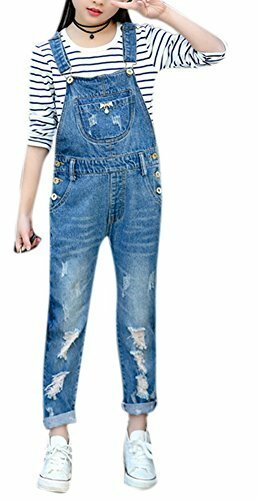 10-11 Years(Tag Size 150 cm): Pants Length:35″.—Waist:28″.—Hip:32″. 12-13 Years(Tag Size 160 cm): Pants Length:37″.—Waist:29″.—Hip:33″. 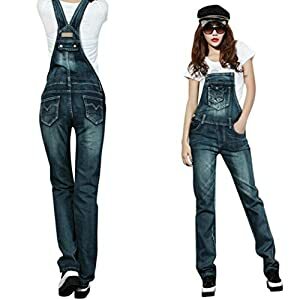 ATTENTION BUYER: The LD@miss is the one authorized seller of this denim overalls. 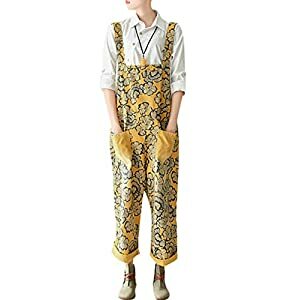 All others are fake cheap counterfeits, other seller (BuyDenim,) offers for this listing could have lower price, however the item will NOT match the real product and must be carefully. 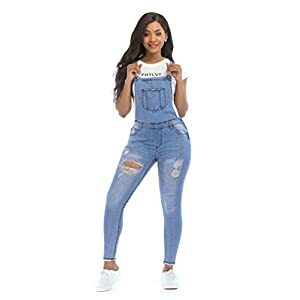 Crafted from pure cotton, these blue wash bib jumpsuits feature rolled up hem, three button openings on the side, elastic high waist design, distressed details on the thigh, adjustable shoulder straps and chest pocket. Occasion & Matched: Girls can wear it to the road, to college, to dating, to outgoing, to a picnic which also comes with a pair of trainers and best.